Few now remember Polmaise Castle, but as the annual march of the Gillies which takes place this Sunday 25 June at 2pm passes near to the site, its history is worth revisiting. The Save Gillies Hill campaign was set up to protect the historic hill from quarrying. Last century, Murrayshall House, built in 1673, home of the Jacobite Ladies of Murrayshall, three sisters who kept the Jacobite traditions alive in Stirling, was lost to the quarry. In July 1966, nearby Polmaise Castle was blown up by the army, less than a century after it was built for Colonel and Lady Murray. 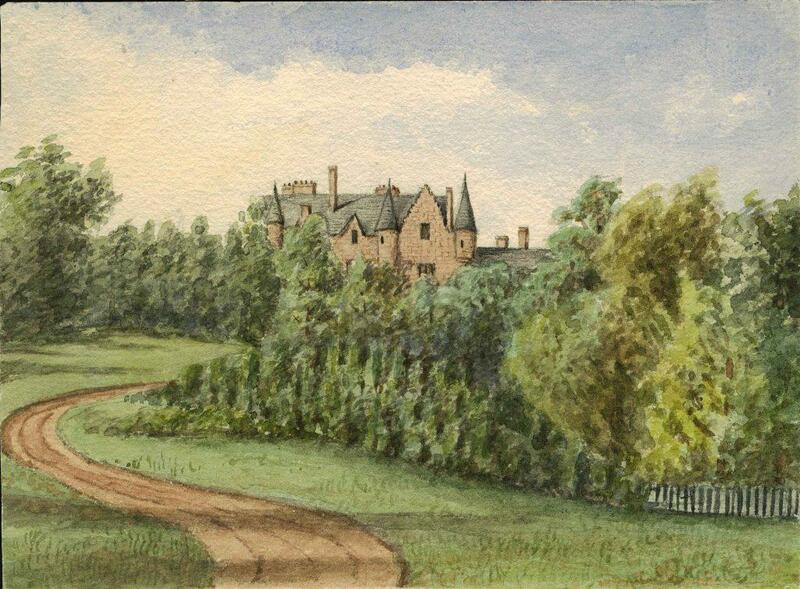 This watercolour is by artist and antiquary Jane Ann Wright (1842 – 1922), and her sister Isabella noted in her journal “On August 6th 1868, Polmaise Castle being completed, Colonel and Lady Agnes Murray left what is now known as Old Polmaise, and took up their new abode”. A full history of Polmaise Castle and its significance for the people of Cambusbarron is available in Peter Paterson’s excellent book, ‘A Cambusbarron Tapestry’. Built in the Fir Park above Cambusbarron, with towers and turrets and on a scale to rival every other country house in the area, it is one of the many historical casualties suffered by Stirling. Next week, we will look at its near neighbour, Bannockburn House. An attractive picture. It would add to the story to see it displayed alongside the few photos of Polmaise Castle that exist. It was a wonderful building and a great shame it wasn’t preserved for the community. A visit to the site to see the blocks of stone remaining from its demolition is both an evocative and sad experience – you are aware of the attraction of the site, but also the sense of something lost.